The year is probably 1944. The picture was taken in the backyard of 3 Outram St. 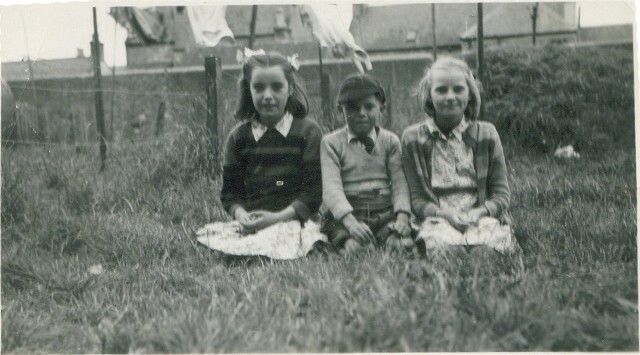 I am in the middle flanked by my cousins left Carol Daniels, and on the right Colleen Birch. In the background, behind the wall, the three houses are: left Hec Macrae's, Harbour House, where Alistair Mclellan lived and next is the Ship Inn. The mound behind Colleen is the air-raid shelter, made of corrugated iron half buried in the ground and covered with soil and grass; it was removed around 1957.